Come to a complete stop before proceeding with caution. Slow and prepare to stop. Come to a complete stop and yield to pedestrians. A Pedestrian Hybrid Beacon (PHB) allows pedestrians to safely cross a roadway. A PHB only operates when activated by a pedestrian. When the PHB is displaying a solid yellow light, you must slow down and prepare to stop. That drivers should come to a complete stop. That an action is forbidden. That some drivers should yield to other drivers. That drivers should drive under the speed limit. Some regulatory signs prohibit certain actions. These signs are rectangular and white with red and black markings. 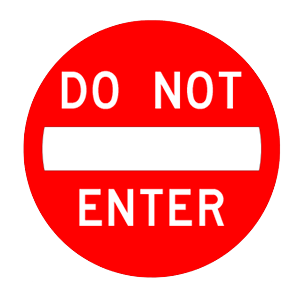 A red circle and slash on top of a black symbol indicates that the specified action is forbidden.